An enormous crocodile living in a river in Africa boasts to another crocodile that he's going to eat a big, juicy child for lunch today. He says he has "secret plans and clever tricks" to catch them. As he travels through the jungle toward the village, he talks to various other animals, and brags about how he's going to eat a child. But every time he tries one of his tricks, one of the other animals foils his plans. This story is pure Roald Dahl goodness. It goes alongside Matilda, Charlie and the Chocolate Factory, and The Twits, belonging on every child's bookshelf. 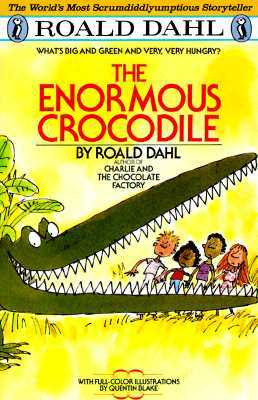 The crocodile is a delightful villain, coming up with many clever tricks, but ultimately defeated by his own bragging. Like many Roald Dahl books, this one is illustrated by Quentin Blake, who is awesome. So the pictures are perfect for the story. It is time! Let the reading begin!